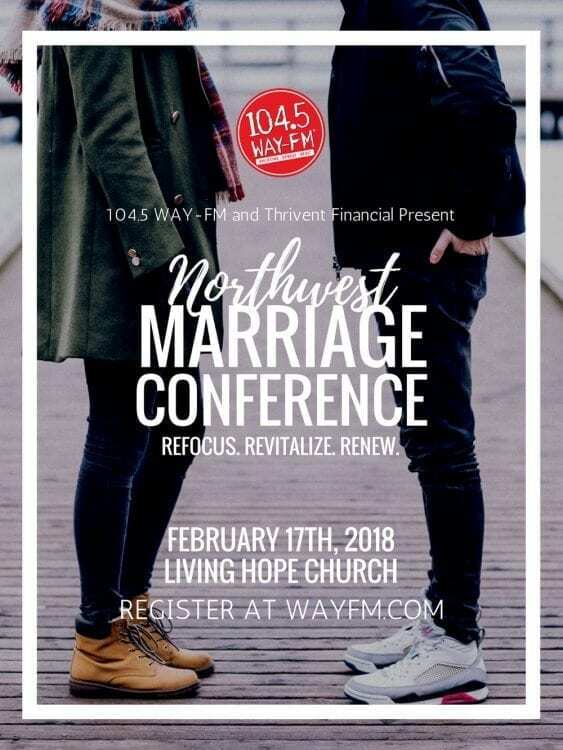 VANCOUVER — Couples in all stages of their marriage will have the opportunity to learn tools to help navigate the struggles of marriage and improve their relationships at the NW Marriage Conference, hosted by 104.5 WAY-FM and Thrivent Financial on Sat., Feb. 17. According to Annette Dexter, event coordinator for the marriage conference, after experiences in her own marriage, she felt called to reach out to Paul Van Sickle, operations and community impact director for WAY-FM, to see if organizing the marriage conference would be possible. Van Sickle said that the conference will have information and sessions for marriages that may be on the verge of collapse to provide hope and tools to improve the relationship. He also said that for couples whose marriages are going well, the conference will help them enhance their relationship and be prepared with methods of addressing hardship when the marriage does struggle. The event is designed to be a day to “refocus, renew and restore marriages,” Van Sickle said. At the conference, attendees will hear from several keynote speakers, as well as have the opportunity to attend two breakout sessions from a selection of six speakers and topics. The keynote speakers include Mike and Laurie Sheffield from Agape Marriage, who focus on forming Christ-centered marriage relationships. Pastor and author Scott LaPierre of Woodland Christian Church in Woodland, will discuss biblical marriage and how to reflect a Godly love in marriage. Dr. Steve Stephens, a licensed psychologist and author, will round out the keynote speakers on marriage. Each of the keynote speakers will also present breakout sessions during the day ranging from such topics as communications, parenting and being a better spouse. Event sponsor Thrivent Financial will host a session about marriage and money, and Marriage Team will host a session about conflict resolution in marriage. Finally, the organization Restored and Remarried will provide a session focusing on successful marriage after a divorce. Dexter noted that the goal of the conference is to offer something for everyone who attends, regardless of their stage in life or marriage condition. Additionally, many of the presenters offer their own seminars and classes, and will feature booths at the event. Thus, Dexter said that there is opportunity for following up on classes and information after the event is over. According to Dexter, tools to help marriages through hard times are not always easy to find, or are simply not sought until a marriage is in trouble. Van Sickle agreed, and said that so often a focus is placed on premarital counseling but not on help after marriage. The conference is designed to provide a “safe setting” to learn and get help in marriage, Van Sickle said. The idea for the NW Marriage Conference first formed in February of 2017, Van Sickle said, and was launched last November. He said that the goal is to make the conference an annual event. Dexter said that the event is open to all, but is open about the fact that “at the heart of it all, Christ is at the center of everything we do.” She hopes that the conference will “arm married couples in the Pacific Northwest with the tools they need to fight for their marriage at all costs. Tickets are available online for $59 per couple and are available until Fri., Feb. 16. Tickets will be available at the door for $69, but Dexter noted that there would be no guarantee that specific breakout sessions would be available if purchasing tickets the day of the event. The NW Marriage Conference will be held from 9 a.m. to 5 p.m. at Living Hope Church in Vancouver. More information about the event can be found online at http://www.wayfm.com/events/nwmc2018/.